Pamper yourself with these easy at-home treatments, and keep the small fortune you would have had to spend at a day spa. Ah... Friday, the end of another hectic week. But any mom knows that the weekends can be just as busy. So before the weekend gets away from you, plan for some well deserved "me" time and have a spa getaway right in your own home. We’ve got five rich treatments that soothe your skin and soul. Everything you need is right in your kitchen (except maybe your partner, if he’s willing to play masseuse!). Be sweet to your skin with a blend of 1 cup brown sugar, 1/4 - 1/2 cup sweet almond oil (you can also use vegetable or olive oil), a teaspoon vitamin E (or a few gel caps’ worth), and 1 teaspoon vanilla extract (or any essential oil you prefer). Mix well and massage onto wet, cleansed skin in circular motions. Rinse and pat dry. This grain’s as good for your complexion as it is for your heart. Stir together 1/4 cup oatmeal (grind it lightly in a food processor first for a finer texture), 1/2 cup warm water, and two teaspoons of honey (its antibacterial properties help fight acne). 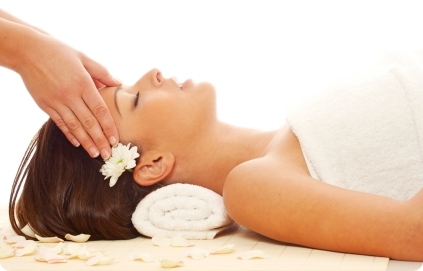 Massage evenly over face with fingertips, relax for 10 minutes, then wipe off, rinse, and pat dry. A blend of exfoliating sea salt and peppermint oil is a welcome cocktail for achy feet at the end of a long day. Mix 1 cup sea salt, 1/3 cup olive oil, and 5 – 10 drops of peppermint oil, and apply to those weary toes. Give extra scrub love to the rough spots, like your heels. Soften cuticles and prevent hangnails with a simple blend of antioxidant-rich red grapes and 2 tablespoons of white granulated sugar. Blend the two in a food-processor, and massage the mixture around each nail. Rinse. Pumpkin puree is plentiful this time of year, and it’s not only a star in yummy seasonal treats. It’s moisturizing and rich in vitamins A and C, both key nutrients for glowing skin. Blend 1/4 cup pumpkin with 1 egg. Add a dash of honey if your skin is dry, or apple cider or cranberry juice if it’s oily. Apply with fingertips to clean skin for 15 minutes, then rinse off and pat dry.